When someone mentions Indian food, I immediately think of curry. I don’t know about you guys, but I could just binge eat a whole pot of chicken curry for the whole weekend. Imagine eating a hearty bowl of warm curry with just enough tanginess and richness from the yogurt, a little bit of freshness from the coriander, and the subtle aroma from the spices. What else could you ask for on a weekend night? Then again I guess not everyone fancies curry because curry can be greasy and high in fat, and people don’t want that. I notice that people tend to be more aware of their health nowadays than ever before. In order to stay in shape, they keep track of their calorie intake and cut down on foods that are high in fat and carbohydrates. In this case, they specifically would want to stay away from curry. So don’t mention the word ‘curry’ to someone who’s on a special diet, you might scare them off. But fear not, because curry can be surprisingly good for your health. The answer lies within the curry powder. Many of the spices found in curry powder have been proven to possess medicinal effects as they have been widely used as traditional medicines. Turmeric, for example, is one of the key ingredients in any curry recipe. Turmeric is the spice that flavours the curry with a warm peppery taste with a subtle hint of an earthy, mustardy aroma. Besides, turmeric has a constituent called curcumin, which gives curry its signature vibrant yellow color. It is curcumin that blesses turmeric with the power to treat inflammation, boost metabolism, and prevent heart diseases. And what’s a curry without a little ginger? Can’t miss out on that. Like many of the spices mentioned above, ginger also has the ability to reduce the risk of heart diseases, and lower blood sugar levels. And, as we all know, ginger is one of the best natural cold remedies. So why don’t you cook up some chicken curry the next time you have a cold? Besides turmeric and ginger, there are a few other spices that have medicinal properties as well. Take cinnamon for example. You may be familiar with this warm and aromatic spice if you love french toast. But did you know that cinnamon has a lot of health benefits? Like turmeric, cinnamon is a natural anti-inflammatory substance, and it is also an antioxidant. Let’s not forget the other spices like clove, coriander, cumin, and cardamom. These warm spices are also excellent in preventing heart diseases, boosting brain performance, and promoting digestive health. That way you don’t have to worry about stomach irritation and enjoy your chicken curry in comfort. Bottom line is, yes, chicken curry is absolutely healthy (thank God!) because of all the medicinal spices within it. These aromatic spices are widely used in many other Indian dishes. So if you want to give them a try, we recommend chicken tikka masala and tandoori chicken. Their recipes are really simple to make, and once you get a taste of them, they will knock your socks right off for sure. Even if you’re on a diet, you can still enjoy curry. All you have to do is make a few tweaks. BE BOLD AND MAKE A FEW TWISTS! Let’s talk about the protein. Of course you can go for whatever you like, whether it is beef, lamb, or pork. But for this recipe, we’re going use to chicken breast. And as we all know, chicken breast is, without a doubt, the leanest cut of the chicken. So you won’t have to worry about consuming too much fat. Don’t worry if you’re a vegan. You can substitute meat for firm tofu, replace chicken broth with vegetable stock, and use coconut milk instead of yogurt. HOW TO MAKE CHICKEN CURRY WITH COCONUT MILK? Yes, you can make chicken curry with coconut milk. 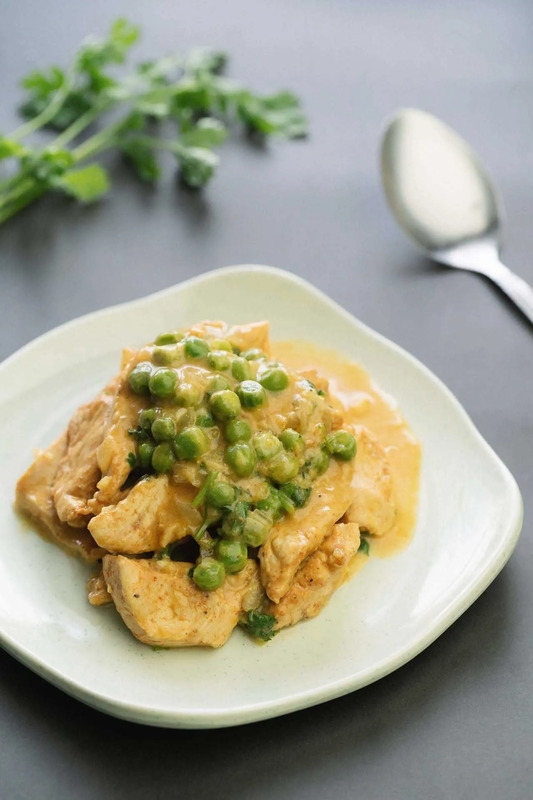 In fact coconut milk is widely used in Southeast Asian style curries, like Thai green curry for example. Coconut milk will make the curry sauce creamier and richer. But unlike yogurt, coconut does not have that light tanginess, and it can be a little bit too rich. So we want to balance the flavors by adding a bit of lime juice in to reduce the richness of the sauce. In order to make chicken curry with coconut milk, simply replace yogurt with coconut milk when you’re cooking. The rest of the cooking process is still the same. WHAT GOES WITH CHICKEN CURRY? As for the side dish, personally I would love to enjoy my curry over a bed of Jasmine rice, or any type of long grain rice for that matter. However, if you want to enhance the flavor of your curry, I recommend eating roti or naan with it as the herbs and spices in these breads will complement the flavor of the curry. Or you can opt for some baguette if you cannot find naan or roti where you live. However, I know that not all of us can have rice and bread in their diet for various reasons. As white rice is high in carbohydrates, eating rice can significantly increase your blood sugar level, which is the last thing you’d want if you have diabetes. So then how can you enjoy your curry to the fullest? Well my friend, the possibilities are endless. Quinoa is a common replacement for rice. Quinoa especially has an exotic texture that will surely surprise you if you’ve never eaten it before. Quinoa is also high in fiber, minerals, vitamins, and protein, giving it an upper hand over your regular rice. However, if you cannot find quinoa in your area, you can opt for some broccoli or cauliflower rice. They’re simple to make and are packed with fiber too. But if you have to eat rice, brown rice would be a better option than your plain old white rice. Why? Because brown rice is high in fiber and minerals. It also contains a high level of magnesium, which can help control blood pressure and improve your heart health. Chicken curry is, without a doubt, one of the best comfort foods that you can ask for. It’s quick and easy to make. And it cures cold! Cut the chicken into thin strips. You’ll want to cut across the chicken breast lengthwise so that you have two fairly equal pieces. Then slice them diagonally into thin strips, about ¼ inch thick. You can slice them thicker if you prefer chunkier pieces of meat. Just make sure they’re about the same thickness so that they cook evenly. Combine salt, pepper, and half of the curry powder in a bowl and mix thoroughly. Coat the chicken evenly with the mixture. The best way to do this is to use your hands and wear a pair of gloves. But if you prefer using bare hands, remember to wash your hands thoroughly with soap before and after you handle the chicken. In a large skillet, heat up some vegetable oil and sauté the chicken over high heat for 3 minutes, stirring occasionally. The chicken should still be undercooked at this stage as we will finish cooking them in the sauce later. Transfer to a bowl and set aside. In the same skillet, turn the heat down to medium and sauté one chopped onion in some oil. Add some salt to make it cook faster. Stir occasionally for 5 minutes or until the onions soften and become translucent. Add minced garlic, ginger, and the rest of the curry powder to the pan and cook for about 1 minute or until fragrant. Dissolve 1 tablespoon of cornstarch in the chicken broth and add this mixture to the pan, along with 2 teaspoons of sugar and a pinch of salt. Bring the heat up to high until the broth starts to boil. Then turn the heat down to medium and cook for 5 minutes or until the sauce reduces and slightly thickens. Add frozen peas and the chicken to the skillet. Cook on a gentle simmer for 5 minutes or until the chicken is cooked through. Turn off the heat, add yogurt and stir to mix everything together. Finally, season with salt and pepper to taste. Serve in a bowl and garnish with chopped coriander. Don’t overcrowd the pan when you sauté the chicken. If your pan isn’t big enough, divide the chicken and cook in small batches. Otherwise the chicken will lose its juices and become dry. You may want to use low-fat yogurt or Greek yogurt if you’re trying to stay on a healthier side. Just don’t use non-fat yogurt as we want to retain the richness of the curry. Try to use homemade chicken broth as you can control the amount of salt you’re adding to the curry. Or you can opt for store-bought chicken broth, but remember to look for the unsalted or low sodium ones. Always season to taste at the end of the cooking process. If you adjust the amount of salt to your liking before reducing the soup, the end result will likely be saltier than you expected.